In her book, PhD by Published Work, Susan Smith writes that one of the disadvantages of this route to a PHD is that ‘it is tricky to retrospectively shoe-horn diverse papers into a post hoc theme’ (p.34). This statement seems to suggest that researchers jump from project to project that have no direct links between them. Maybe this is the case for researchers, associated with universities, who may have to work on projects which are not their principal area of interest, either because these projects bring in funding, or because papers from these projects will contribute to their University’s research excellence framework (REF). I can see that this might lead to diverse papers that are difficult to pull together, but neither of these constraints applied to me, since I have always worked as an independent researcher. It is not just that what we find determines the nature of attention we accord to it, but that the attention we pay to anything also determines what it is we find. Perhaps not surprisingly, in order to select papers, I first had to refresh my memory about these publications. Once a paper has been published I tend not to go back and reread it multiple times, but instead move on to the next research project. Although I knew the general gist of all the papers, I didn’t remember all the detail. So I started by working on a mini literature review of my own papers, critiquing them, summarising them, checking the number of citations and how and where the work has been disseminated. Looking back at my journal, I can see that I didn’t find this process particularly easy. It was time consuming and my first summaries were streams of consciousness rather than summaries. Ultimately, I ended up with the summaries of the papers I selected that are in Appendix 3 of the thesis – Jenny Mackness PhD (Pub) 2017. To decide on which papers to select, I used Matthias Melcher’s Think Tool, which allows you to enter text into a mapping tool and look for links between the entered texts. Since 2009, I have published 20 papers and one book chapter. I entered the Abstracts of all these publications into the Think Tool and as a result was able to create 6 groups of papers and identify cross-paper themes. I blogged about this process at the time – A new mapping tool: useful for research purposes. From this process it became clear to me that whilst a large body of work was related to emergent learning, and I could have focussed solely on that, in fact even those papers resulted from participation in MOOCs and a deep interest in how learning occurs in these open environments at the level of the individual learner. I felt there was only one group of papers that diverged from this and that was the group that looks at whether and how learning design can be influenced by an embodied view of the world and a view of perception and action as enactive perception using all the senses, but even these papers originated from an interest in the design of learning environments. Having decided on which groups to focus on there still remained the question of how many papers to select. For Lancaster University, there was no advice on the number of papers to be submitted other than that the material submitted must be “sufficiently extensive as to provide convincing evidence that the research constitutes a substantial contribution to knowledge or scholarship.” At this stage I went into the department to look at the PhDs by Published Work already awarded, to discover that there had only been three since 1999 (1999, 2003, 2010) and each of these was awarded to a member of staff in the department, who submitted 9, 11 and 10 published works respectively together with a supporting statement of around 40 pages, although I have seen other examples from Lancaster University considerably shorter than this. Ultimately, I submitted 13 papers and a supporting statement of 101 pages. I mention this not to suggest that the number of pages is in any way significant, but just to illustrate that it seems that at Lancaster University there is a wide variety of practice. I wouldn’t be surprised if this is the case across universities. The uncertainty associated with this was not easy to work with, but on the other hand seemed to mirror the unpredictable learning environments I have researched, where I have worked with no externally imposed rules or expectations. Throughout this process I felt I was working in the same way I have always worked, i.e. working it out as I went along, and letting the process and structure emerge. One of my ‘critical friends’ who gave me feedback on the thesis after I had submitted but before the viva thought that my important work was related to the ‘Footprints of Emergence’ framework and emergent learning rather than the empirical papers and I think that my colleague Roy Williams, probably thinks the same, although he hasn’t said this. 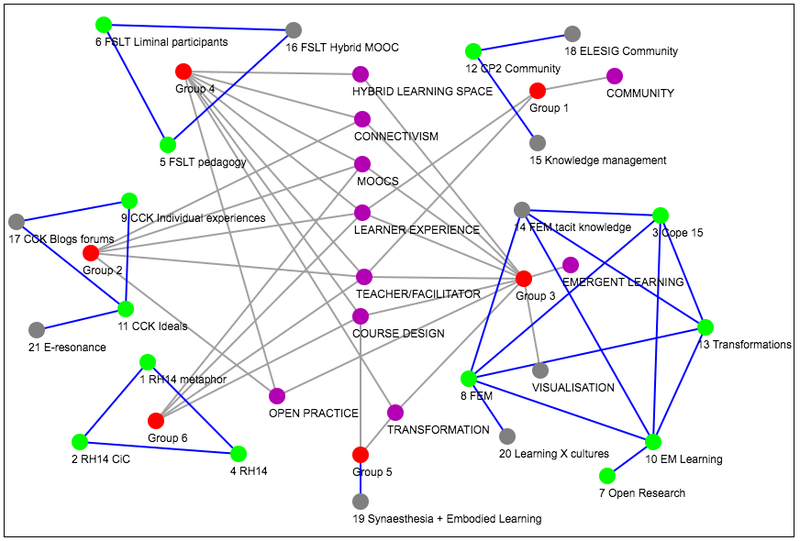 But the analysis of my papers, using Matthias Melcher’s Think Tool, revealed my ‘golden thread’ (as Susan Smith calls it) to be ‘learners’ experiences in cMOOCs’, so that is what I focussed on. I have never felt comfortable with mapping. It seems to involve a way of thinking that just doesn’t come naturally and interpreting other people’s maps seems to be beyond me. Three years ago I attended Howard Rheingold’s online course Towards a Literacy of Cooperation, where mapping was a weekly activity. I blogged about this and without realising it found I had the title Minding Mapping in the Social Media Classroom. I thought I had written Mind Mapping in the Social Media Classroom. It was only later when I came back to the blog post that I realised what the heading was. But this year I am giving it another go, using the Think Tool Matthias Melcher has developed. I have been looking back through all my published papers and I wanted to see if I could trace my development of thinking through these papers, what the common threads are, what links there are between the papers and what the maps might reveal about my research interests and development as a researcher. The tool can also be accessed from his blog where he discusses it further and provides a wonderful explanation of how it works in this video which you probably need to watch if you are going to make sense of what follows. (Allow 5.44 mins to watch the video). Maintaining an overview of multiple connections and not having to organise ideas into discrete categories. Maintaining the richness of the associated text alongside the map. The text does not have to be visible, but can be accessed with a simple click of an icon. These two affordances seemed perfect for looking for connections between my own research papers. I have created my own video to show how useful this tool is and how I have used it to date. (This is a 12-minute video. It is a bit blurred, but hopefully not impossible to follow). Group 2: The affordances, tensions and constraints of open environments, notably MOOCs, for learning experiences and connectivity with reference to the theory of connectivism. I have also been able to identify major and minor keywords that crop up across the papers and how methods and theory are referenced, again across all 22 papers. As I say in the video, Matthias’ Think Tool has been extremely helpful in enabling me to see the connections between my papers and the common threads. For anyone looking for connections across a multitude of concepts/ideas, I can recommend giving it a go.